Joe Drinkhouse, US Army, Mullica Hill, was honored for his service to this country at the ShopRite in Mullica Hill on Armed Forces Day, May 19. Each year, ShopRite holds an annual luncheon to honor community veterans. 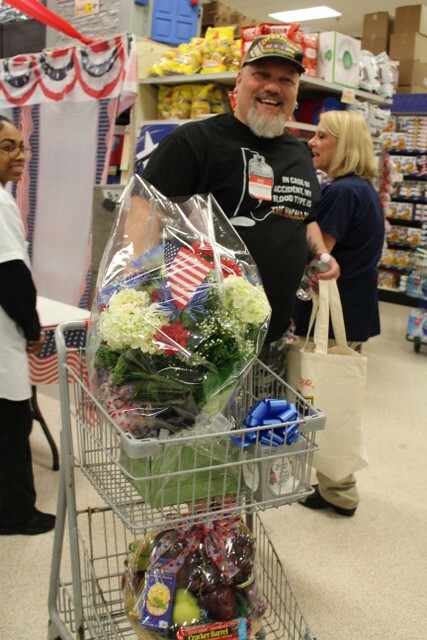 Zallie Supermarkets, Inc., which owns and operates seven ShopRite Supermarkets in Camden and Gloucester Counties, once again rolled out the red carpet to welcome over 40 South Jersey veterans during the Seventh Annual Luncheon to honor veterans on Saturday, May 19. This year’s store events took place on Armed Forces Day, a holiday that encourages people to thank military members for their patriotic service in support of the country. Mullica Hill’s own Joe Drinkhouse, U.S. Army, was honored. Storeowners Bruce and George Zallie and nearly 2,000 ShopRite associates look forward to hosting the annual lunches each May as a way to give back to and recognize veterans who live in the communities served by their ShopRite stores. “These brave veterans are our neighbors, friends and role models and we are humbled to once again host six veterans and their families at each of our seven stores. These special lunches give us a moment to pause and help recognize the enormous sacrifices veterans have made for our freedom,”Bruce Zallie said. “In addition to this year’s luncheon, all Zallie Supermarkets, Inc. ShopRite stores offered active and retired military personnel a five percent discount on in-store purchases. Stores hosting luncheons and offering the military discount included: ShopRite of Williamstown, ShopRite of Sicklerville, ShopRite of West Berlin, ShopRite of Glassboro, ShopRite of West Deptford, ShopRite of Chews Landing Road in Laurel Springs and ShopRite of Laurel Hill in Clementon. With the help of local VFW locations, six veterans were identified and invited to attend each store event. Each veteran received a $200 bank gift card, a patriotic floral arrangement created by Zallie’s Own floral department, a gourmet fruit and cheese basket.